Suppose you want to adjust a project's schedule date by adding two weeks to see what the new completion date will be, or you want to determine how long a single activity will take to complete in a list of project tasks. You can add or subtract a number of days to or from a date by using a simple formula, or you can use worksheet functions that are designed to work specifically with dates in Excel. Suppose that a bill of yours is due on the second Friday of each month. You want to transfer funds to your checking account so that those funds arrive 15 calendar days before that date, so you'll subtract 15 days from the due date. In the following example, you'll see how to add and subtract dates by entering positive or negative numbers. Enter your due dates in column A. Enter the number of days to add or subtract in column B. You can enter a negative number to subtract days from your start date, and a positive number to add to your date. In cell C2, enter =A2+B2, and copy down as needed. You can use the EDATE function to quickly add or subtract months from a date. The EDATE function requires two arguments: the start date and the number of months that you want to add or subtract. To subtract months, enter a negative number as the second argument. For example, =EDATE("9/15/19",-5) returns 4/15/19. For this example, you can enter your starting dates in column A. Enter the number of months to add or subtract in column B. To indicate if a month should be subtracted, you can enter a minus sign (-) before the number (e.g. -1). Enter =EDATE(A2,B2) in cell C2, and copy down as needed. Depending on the format of the cells that contain the formulas that you entered, Excel might display the results as serial numbers. For example, 8-Feb-2019 might be displayed as 43504. Excel stores dates as sequential serial numbers so that they can be used in calculations. By default, January 1, 1900 is serial number 1, and January 1, 2010 is serial number 40179 because it is 40,178 days after January 1, 1900. Press Ctrl+1 to launch the Format Cells dialog, and click the Number tab. Under Category, click Date, select the date format you want, and then click OK. The value in each of the cells should appear as a date instead of a serial number. The YEAR function looks at the date in cell A2, and returns 2019. It then adds 3 years from cell B2, resulting in 2022. The MONTH and DAY functions only return the original values from cell A2, but the DATE function requires them. Finally, the DATE function then combines these three values into a date that's 3 years in the future — 02/08/22. The YEAR function looks at the date in cell A2, and returns 2019. It then adds 1 year from cell B2, resulting in 2020. The MONTH function returns 6, then adds 7 to it from cell C2. This gets interesting, because 6 + 7 = 13, which is 1-year and 1-month. In this case, the formula will recognize that and automatically add another year to the result, bumping it from 2020 to 2021. The DAY function returns 8, and adds 15 to it. This will work similarly to the MONTH portion of the formula if you go over the number of days in a given month. The DATE function then combines these three values into a date that is 1 year, 7 months, and 15 days in the future — 01/23/21. Here are some ways you could use a formula or worksheet functions that work with dates to do things like, finding the impact to a project’s schedule if you add two weeks, or time needed to complete a task. Let’s say your account has a 30-day billing cycle, and you want to have the funds in your account 15 days before the March 2013 billing date. Here’s how you would do that, using a formula or function to work with dates. In cell A1, type 2/8/13. In cell B1, type =A1-15. In cell C1, type =A1+30. In cell D1, type =C1-15. In cell A1, type 10/24/13. In cell B1, type =EDATE(A1,16). To format your results as dates, select cell B1. Click the arrow next to Number Format, > Short Date. We’ll use the same EDATE function to subtract months from a date. 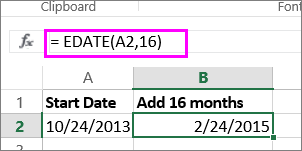 Type a date in Cell A1 and in cell B1, type the formula =EDATE(4/15/2013,-5). Here, we’re specifying the value of the start date entering a date enclosed in quotation marks. You can also just refer to a cell that contains a date value or by using the formula =EDATE(A1,-5)for the same result.